Great monoprotein food for allergic dogs :"We happen to have one very allergic dog it is difficult to find food without chicken (he has allergy to) but as well without other allergens he can't tolerate. 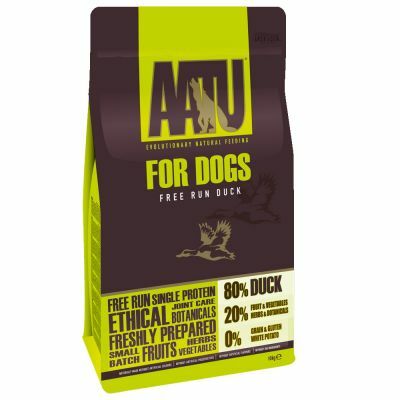 AATU made a trick and we are happy and p"
With 80% premium duck meat, AATU 80/20 Duck Complete Grain Free is high in protein, consistent with a dog’s natural nutritional needs. This high quality dry kibble contains up to 51% freshly prepared meat and 29% dried duck meat; all sourced from selected British free range duck farms. 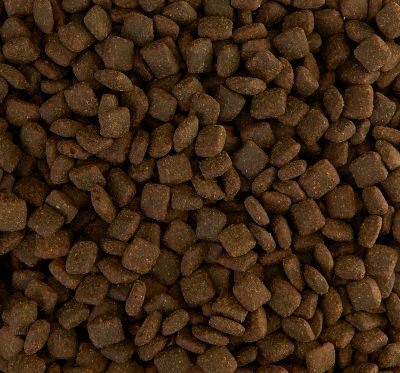 20% of the kibble is made up of a combination of natural herbs, beneficial plant extracts, fruit and vegetables. 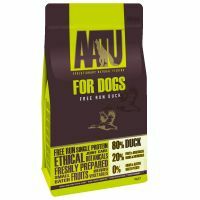 AATU 80/20 Duck Complete Grain Free is a complete dry dog food. Please note that these are only guidelines. Actual feeding amounts depend on your pet's age, activity levels and other individual circumstances. Monitor your pet's weight and adjust feeding amounts as required. Fresh water should be provided at all times. We happen to have one very allergic dog it is difficult to find food without chicken (he has allergy to) but as well without other allergens he can't tolerate. AATU made a trick and we are happy and pleased with this food for him. than eat this food. During the change over from his old food (Lukullus), he ate it with gusto and for a week later, on it's own, then everything went pear shaped. He totally refused to eat it, even with his favourite fish mixed through. An expensive mistake. Ah well.....back to the Lukullus. My fussy 4 year old GSD has been on another good 80/20 (Simpsons) for 3 years. It was a good food - but she ate it reluctantly. I gave AATU a try last month (Duck variety) and she practically stuck her head in the bag to get it. She loves it - there were no tummy troubles in the changeover. Top marks. I have an allergic dog who also happen to be a very fussy eater. She loves this food and it actually seem to have only 1 protein as my dog is allergic to chicken and her tummy would burst with blisters if there was any chicken in it. No allergic reactions since she's been eating Aatu Duck and still very enthusiast at every meal. I am happy to pay the extra money for a premium quality food if I can have a happy healthy dog. Our two Westies have been on AATU Duck for 15 months. We were looking for a suitable single protein food that would help the skin problems with one of our dogs. AATU Duck has done the trick, we are now just over a year without steroids or antibiotics which is a huge improvement from having to visit the vet every 4-6 weeks. Of course the other great benefit is that they both love the food! AATU is definitely worth every penny. My dogs like this food,they are waiting for food time much than ever!Very good ingredients nice smell ,good taste!We love it! for 3 years i could not find a dog food that suited my dog and one that i was happy to feed her then aatu came along and from that day its all she eats yes it may seem pricey but you have to feed so little of it that if you compare it to a cheaper alternative you would have to feed double so it works out cheaper to feed aatu. This food is ideal for all ages and sizes of dogs ,even if you have fussy eaters as I do they will eat this kibble with gusto .It smells good ,really meaty ,what goes in stays in and doesn't cause tummy issues or runny stools . We usually feed our malamute Orijen but tried AATU as they were sold out of Orijen and AATU came highly recommended on another site. We ordered 2 bags, one duck and one fish to try and give him some variety as I think he was getting bored eating the same flavour Orijen (13kg) for weeks at a time. The AATU bags were 10kg each so we got 20kg for the same price as the 1x 13kg Orijen bag. It was nice to see the AATU bags come with a handy zip lock and as soon as we opened the bags we could tell our Malamute was going to like both flavours. We started with a small handful of both and he devoured them as if they were treats. He then gobbled down a serving of each, one after the other. It is still early days but from our initial experience I'd say our puppy is the opposite of the last review. This is what we should be feeding our dogs! This is the best kibble for you dog. We got this from a superstore to try as we had never heard of it before and looked good. Will only be purchasing it from here now. Got 30kgs and it's an absolute bargain!!!!!!! The dogs loved it!! We have 7 and they could not wait for us to put their bowls down. It smells nice and because it is full of good ingredients, they have less too! 5*s from our mutts! Photos to follow.